It is worth looking out for miniature and dwarf varieties of fruits and vegetables that can be container-grown and will provide the added attraction of flowers and fruits through the summer as well as fresh food for the dinner table. Tiny cherry tomatoes are ideal and can be grown in hanging baskets. You might also like to try growing miniature aubergines, dwarf courgettes or an ornamental sweet pepper plant that produces fruits in shades of red, green, yellow and purple which are as attractive as any exotic flower. If the balcony is a real suntrap (and with its exposed position and the right screening this is quite likely), the high-rise gourmet can do very well indeed, with good yields and early ripening. Modern hybrids and varieties are specially bred to produce the maximum fruit from the minimum-sized plant; you may be able to pick up to 5 kg (10 lb) of soft fruit or tomatoes from just one plant. 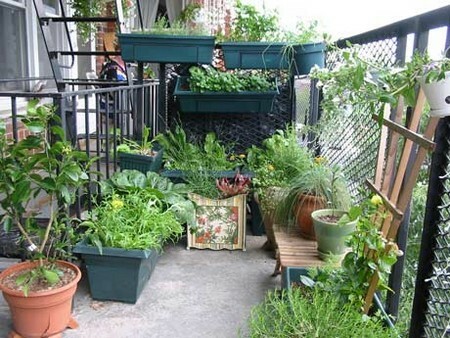 Depending on the size of your kitchen balcony, you could extend your scope from pot-grown herbs, tomatoes or strawberries to raised timber beds or boxes in which you can grow some quick-cropping salad plants — radishes, spring onions, Little Gem lettuces and perpetual corn salad are all ideal. Few experiences match the pleasure of pulling a handful of these vegetables for an instant fresh salad from your own backyard balcony. If eating your own produce gives you a thrill, why not find space for a few vegetables too? Even potatoes can be grown in a barrel, or you could plant up grow-bags with a limited variety of compact vegetable varieties such as stump-rooted carrots or short-growing peas and broad beans. These bags are not particularly attractive, so if you want the area to look stylish you will have to disguise them in some way behind a timber- or brick-faced frame. You will also have to provide some form of drainage so the vital regular watering does not flood and ruin the balcony floor: specially designed troughs and trays are available for this very purpose. Runner beans, with their large green leaves and red, purple or white flowers, make lovely annual balcony climbers for a trellis or screen — the beans are almost a bonus. Fruits can also be grown in pots and trained against a vu balcony wall or trellis. The kiwi plant, Actinidia chinensis, is sir often grown purely as an ornamental climber but it will A produce curious egg-shaped edible fruits given plenty of co warmth and sunshine. Soft fruit bushes such as red or white w\ currants, blackberries and loganberries, can be trained into as flattened fan shapes along wires and blackcurrants could be lo pruned hard into a compact bush. A sturdy balcony could even support one or two dwarf fruit trees; if the branches were trained along horizontal wires to produce espaliers and cordons they would take up very little space. Apples and pears are particularly suited to this treatment but you will need at least two compatible varieties, or one of the new multi-types grafted on to a single trunk, for successful fertilization. For hot sunny sheltered balconies, peach, nectarine and apricot trees can be bought ready trained into fan shapes, and the flowers and foliage are just as pretty as the fruits. In places where the winters are cold or the balcony is very exposed, fruit trees and bushes will need to be protected with sacking. One popular patio and balcony plant is the citrus tree, which can be clipped and trained as a standard – a single straight stem with an attractive tight ball of foliage on top -and grown in a large terracotta pot or ornamental Versailles planter. These are so pretty that they are mostly grown for decoration and considered an accessory rather than a source of fruit, which is almost too attractive to pick. Because the pot or tub can be brought indoors during very cold weather, these trees can be grown on any sunny balcony.